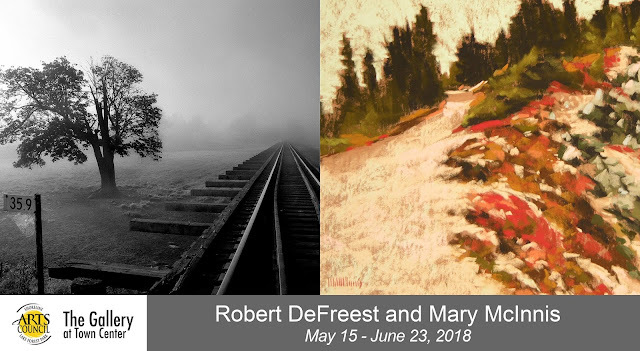 The Gallery at Town Center is exhibiting a selection of works by Photographer Robert DeFreest and Pastel Artist Mary McInnis. See these works and the creations of over 90 other local artists during gallery hours: Tuesday – Saturday, Noon to 5pm. Robert’s formal education in the arts began at the University of New York at New Paltz in the theatre arts, with a concentration in design, construction and acting. Within a year he transferred to the state University of New York at Binghamton to pursue filmmaking. After graduation he worked in theatre, film and television in various capacities. It was after relocating to the Pacific Northwest that he discovered low light and night photography, which quickly blossomed into a passion. He is self taught in photography, having no formal education in it, instead opting for the school of constant experimentation. This paid off with acquiring a job as a photographer for ten years in Las Vegas, NV. Having recently relocated back to the Pacific Northwest he is once again pursuing the type of work which fuels his creative spirit and imagination. What is it about art and the creative process that causes one to spend an entire life pursuing creative outlets of various kinds: drawing, painting, photography, stagecraft, handcrafts, music, even creating a living space for troll dolls and harnesses for toy horses? This has been my life’s pursuit mixed in with raising two girls and now a granddaughter, voracious reading, watching classic movies, traveling whenever possible, volunteering in various capacities. I am surrounded by art – my own, my friends’, in books and magazines. Music of all kinds (with a few exceptions) fills the air in my home, my studio, and my car. I cannot fight it. It is who I am. The Gallery at Town Center is a program of the Shoreline - Lake Forest Park Arts Council and is located inside the Lake Forest Park Town Center on the lower level. 17171 Bothell Way NE, Lake Forest Park 98155.